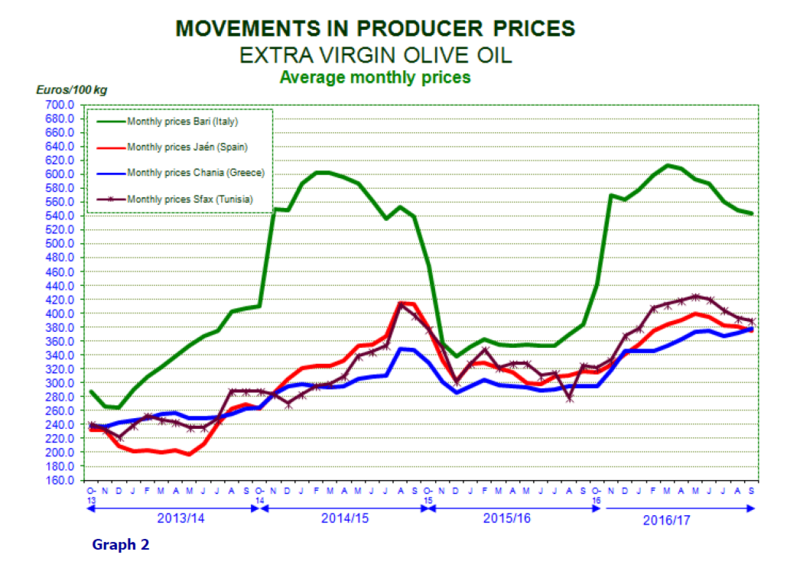 Graph 1 tracks the weekly movements in the prices paid to producers for extra virgin olive oil in the top three EU producing countries and in Tunisia, while graph 3 shows the weekly changes in producer prices for refined olive oil in the three main EU producer countries. Monthly price movements for these categories are given in Graphs 2 and 4. 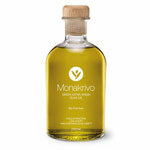 Extra virgin olive oil – Producer prices in Spain have slightly decreased over the last few weeks, coming in at €3.72/kg in the second-to-last week of September 2017, which is a 17% increase compared to the same period the previous year. 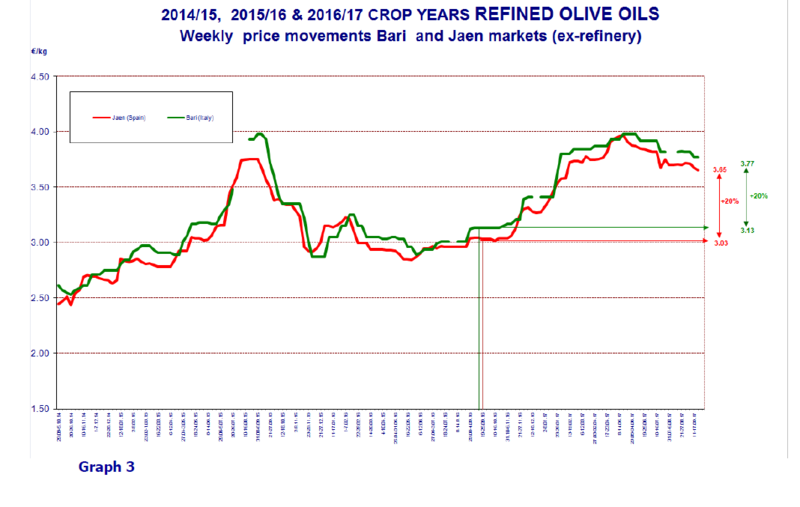 A comparison of this price with the maximum price in the third week of August 2015 (€4.23/kg) indicates a 12% decrease (Graph 1). Italy – Prices in Italy have tapered off in recent weeks, coming in at €5.42/kg in mid-September 2017, which is a 38% year-on-year increase. 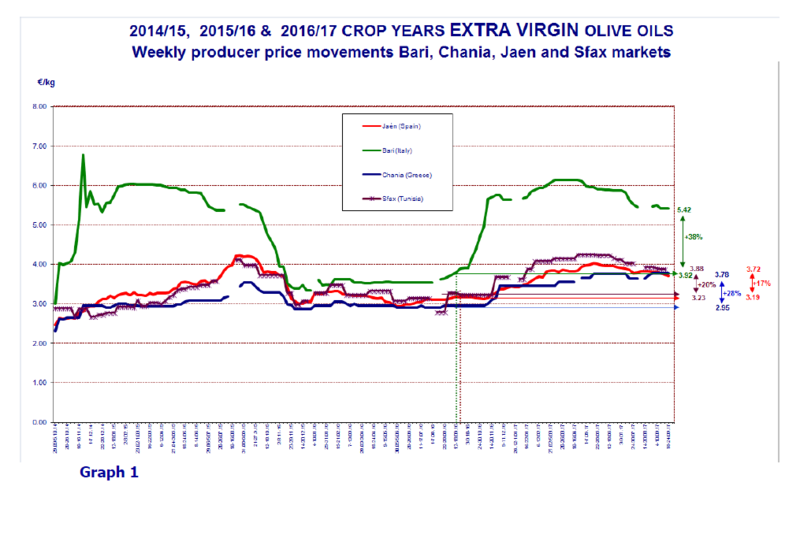 Graph 2 shows the monthly price movements of the extra virgin olive oil category in recent crop years. Greece – The prices in Greece have remained stable in recent weeks, coming in at €3.78/kg, which is a 28% increase compared to the same period the previous year. Tunisia – Prices in Tunisia, following a period of stability from mid-April to mid-June, decreased slightly in recent weeks coming in at €3.88/kg in mid-September 2017 for a 20% year-on-year increase. 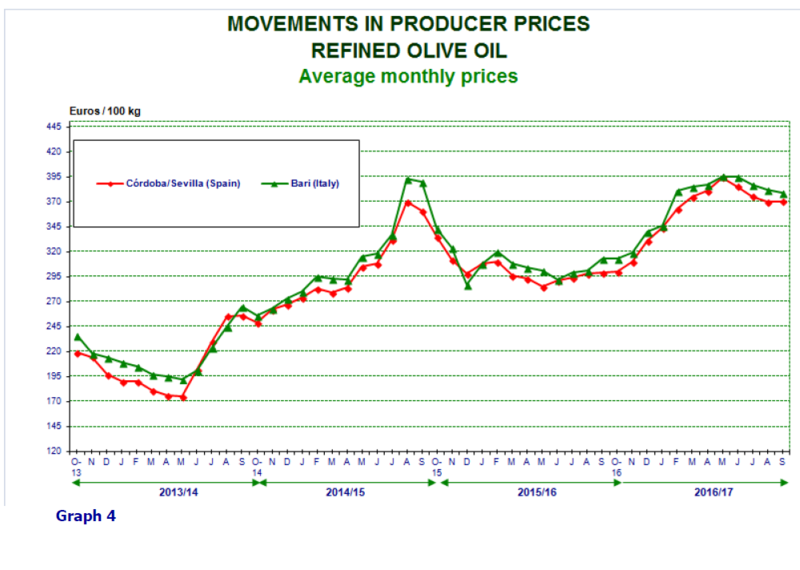 Producer prices for refined olive oil in Spain and Italy generally follow the same trend as the prices for extra virgin olive oil. The price in Spain in September 2017 stood at €3.65 /kg, up by 20% compared to the same period the previous year. In Italy it reached 3.77€/kg, for a 20% year-on-year increase. No price data are available for this product category in Greece. 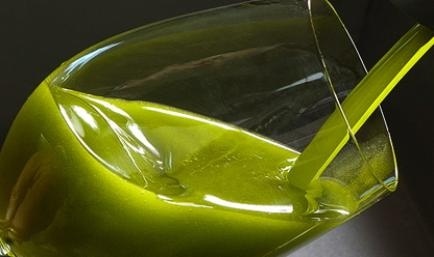 In mid-September 2017, the price difference in Spain between refined olive oil (€3.65/kg) and extra virgin oil (€3.72/kg) was of €0.07/kg. In Italy, the price difference between the two categories was greater than in Spain at €1.65/kg (Graph 3).